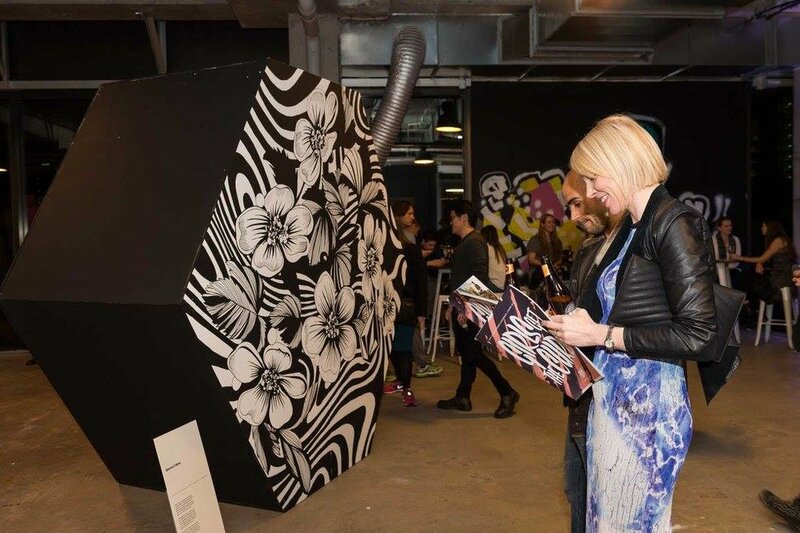 Recently I created live art for the Luxottica event in Brisbane. The emersion night featured several big name fashion labels including Bulgari, Versace, Ray ban & Dolce & Gabbana. I represented Dolce & Gabbana for the night drawing a pair of the designer sunglasses in front of a live audience. The audience could come up and watch me draw the art while wining and dining and learning the history of the brand. Here's my process in creating this piece. I've said it before but I think its really important to create your own reference images. I always think whats the point of drawing a realistic replica of a photo? It's already been created by that photographer no need to put another version out into the world. You can though pull it apart and turn it into something amazing that no ones seen before and make it your own. I kind of make these "Frankenstein" ladies in photoshop to create exactly what I want to draw in my head. So its the body from one image, the head for the another, the hair from another and the flowers are inspired from a tattoo. You can see all of this in the moodboard I created. You can see below how rough the reference is I create in Photoshop. It doesn't need to be perfect you can fix up the mistakes in the drawing. It's just a guide line for you to look at while you draw. 1.What was your inspiration behind the prints? I always love creating tropical prints but this one is inspired by 60’s & 70’s wall paper designs as well. 2.We know you design killer surf prints but we have to ask; surf or snow? I live next to the beach so definitely surf! 3.What inspired you to start Illustration? I was studying graphic design and a friend in my class showed me these amazing fashion illustrators work online and I think I was hooked from that point and had do that kind of design from then on. 4.What’s your favourite sunnies by Vonzipper at the moment? I’ve always liked anything from the F.C.G. collection, I wear those sunnies everyday. 5.If you were stuck on an island with a Vonzipper advocate who would it be? 6.What are you listening to right now? 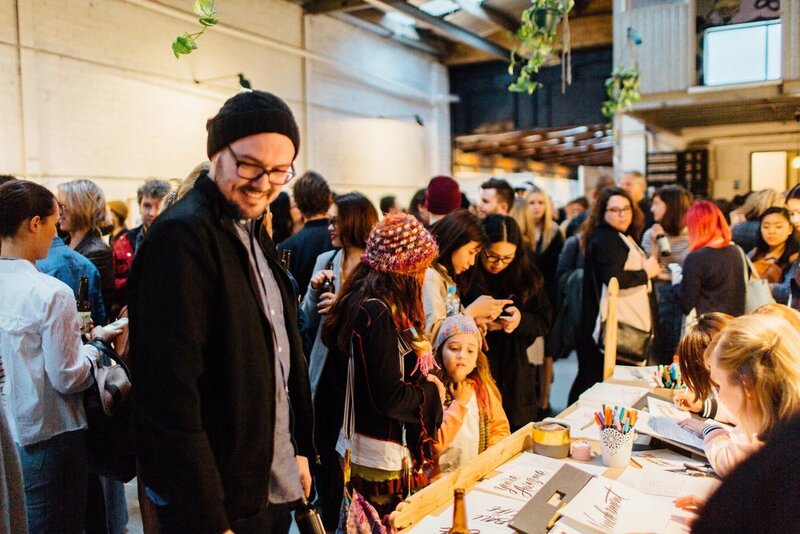 Earlier this month I was lucky to be apart of Golden the exhibition at Workshop Melbourne. I exhibited along side amazing artists 23rd Key, Viet-My Bui, Mark Conlan, Luke Day, Bobby Haiqalsyah, Kitiya Palaskas, Ellen Porteus, George Rose, Al Turnbull and Cat Wall. The event was amazing! Such a fun night and all of the proceeds went to Streat a charity helping homeless youth. Thanks to everyone you came to event and bought a print of my piece "Luna". It's one of my favourite pieces and I'm glad they've got some happy new homes! 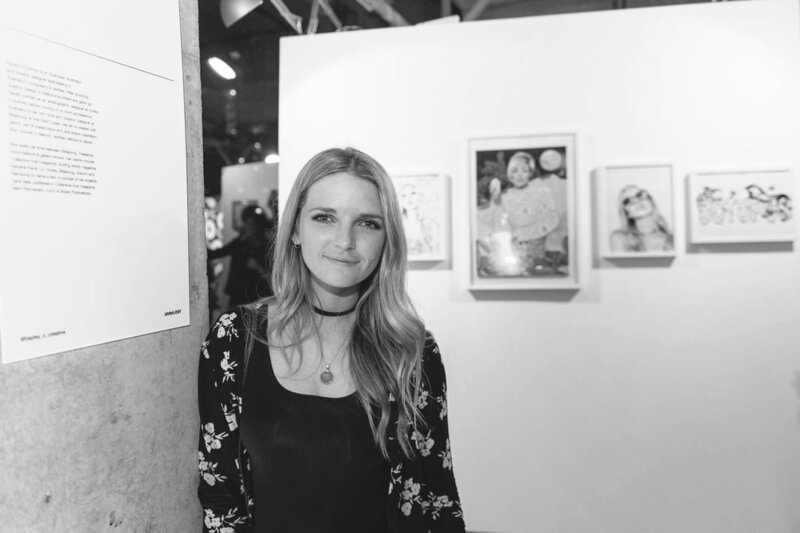 Last week I was lucky enough to be apart of the 2016 Curvy exhibition launching the Curvy Creative Conference in Sydney. My art was along side Gemma Obrien, Kimberley Reynolds, Nicole Reed, George Rose, Nadia Hernandez, Lauren Winzer, Jana Bartolo, Rachel Ponygold Urquhart, Kimberley Reynolds, Lauren Bath, Ainsley Hutchence& Josie Clough. I've been apart of the Curvy exhibitions in the past and published in Curvy 8 & 9 books but it was still just as exciting to be involved with the Curvy crew. Check photos from the event! This month I was featured in Surfing World Magazine. I was pretty much told to do anything I wanted with the word octopus just do it my own way and don't draw an octopus! I've always loved drawing mermaids and have been enjoying working with markers and pens a lot more lately. Also been dying to do a horror font so felt it was the perfect brief to give it a go.